In the prologue provided by the author as a commentary for the reader of the rather significant year, on many levels, of 1984. As it pertains to this story, India’s Prime Minister Indira Gandhi has been killed and the rumours are running rampant regarding the particulars of how this occurred. Everyone has their own interpretation of what happened from the nosy neighbour to the meddling milkman. When word gets around that she was assassinated by two members of her own security detail, the world for many Sikh families (but one in particular for this book) will never be the same. Profound theme from the onset of this novel is don’t always believe what you hear, and always analyze the source of where information is coming from before irrevocable mistakes are made. Inspector Singh is not the representation of a physical specimen that you see in Da Vinci’s Vitruvian Man. You know that one you would think of when imagining the stature of the most successful leading murder investigator”s in Asia. He smokes a lot, he likes to drink, take extended lunches and he is a rather portly man that tends to sweat more than the average man; I suppose this is also the reason that he is vastly unappreciated. With all of his misgivings, he gets the job done and does it in a remarkable way. If you need a reference point, and have seen a fair share of foreign films, think the lead character from Memories of Murder. By the appearance of the front cover, the font used for the book title, and the blurb highlighting a physically encumbered police officer, one can expect some sort of comical high jinx or Tom foolery. With that said the story in itself is quite heavy with culture clashes, honour/dishonour killings, political/religious strife, corporate environmental irresponsibility and terrorism. From my initial perceptions I was more shocked by the true purpose coinciding with the relative lack of humour. Which in the end is fine by me, I don’t mind a cozy mystery but there definitely are times when you hold your breath as some of the characters make their presence known. On the other hand, Mumbai Police Detective Patel’s constant fudging of common idioms and expressions was quite funny and kept Singh, as well as myself anticipating what he was going to come up with next. One problem I had with this story were the catalog of involved characters. They all had a role, albeit some were smaller than others, but constantly taking a mental note became tiresome. Beyond that there really weren’t many complaints with this book. 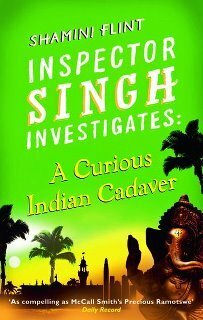 I was impressed with the novel and after reviewing some of the author’s prior work in this series I probably won’t go back and read earlier stories of Inspector Singh, but I definitely look forward to where she is going next.